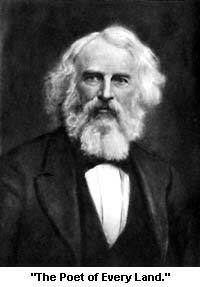 hen Henry Wadsworth Longfellow, the poet, was a boy, he lived in Portland, Maine. In those days Portland did much trading with the West Indies, and Henry and his boy friends liked to stay down at the wharves when the Portland vessels came in. It was sport to watch the burly negroes unload the hogsheads of molasses, the barrels of sugar, and the spices. The boys used to wish they were sailors or captains, so that they could sail across the water and perhaps have great adventures. Henry also thought it would suit him to be a soldier, and when he was five years old, and there was much talk about the great war which is called the War of 1812, he sent a letter to his father, who happened to be away at the time, that he had a toy gun already, and if his father would please buy him a drum, he would start right off for the battle-field. Probably he was not as warlike as he fancied he was, for one Fourth of July just after that, he jumped every time a cannon went off and begged his mother to stuff his ears with cotton, so that he would not hear the banging.